Have you ever tried a tomato curry? 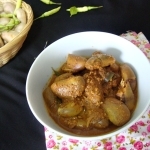 (Thakkali Curry) With all flavors of tomato, a little bit sour and bit milkfish with addition of coconut milk, a tomato curry is a great side dish for string hoppers. This is also a perfect tomato curry for rice. 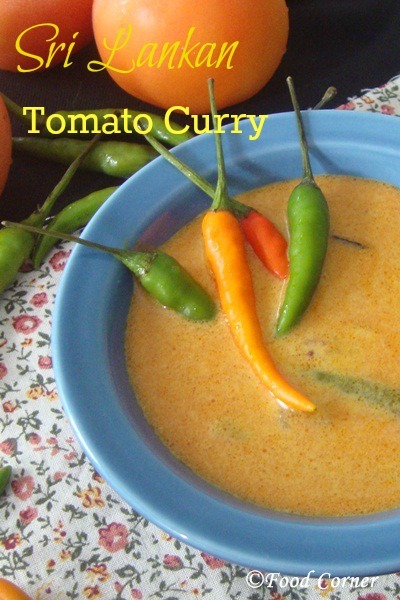 But, in Sri Lanka we most of the time use tomatoes to enhance flavours of other curries. Tomatoes add flavor to long beans curry or even for a chicken curry. Other than mixing with different vegetables, this time I want to share the recipe on how to cook tomatoes as a curry without any other main ingredient. 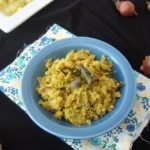 If you are a Sri Lankan you probably love this dish. 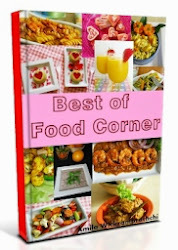 Otherwise, if you like to try curry dishes, then here is a new recipe for your collection! 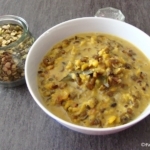 Have you checked this Sri Lankan kiri hodi recipe? It is another way to cook tomatoes in a curry. As another tomato curry, in kiri hodi, we don’t use red chili powder. 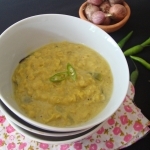 Instead it is cooked with green chilies and finally curry looks white or yellowish. 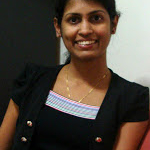 But in this thakkali curry recipe, we cook tomatoes with red chili powder. So, the appearance is reddish. 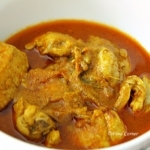 Remember, tomato is sour doesn’t mean this tomato curry is a sour recipe such as raw mango curry. Instead the taste should be a mix of sour, spicy and sweet. Sweetish creamy taste is from thick coconut milk and not from added sugar! If you look for vegetarian recipes with tomatoes, then avoid adding Maldive fish. When you don’t add Maldive fish, this tomato curry is one of the vegetarian recipes from Sri Lanka which you can enjoy the flavours of tomato. Well, this is how I cook tomato curry in Sri Lankan style. Try it and as always please let me know your experiences and ideas! Slice onion, wash and cut tomatoes into pieces, wash and split green chilies. Keep aside. Heat oil in a pan. When it is hot add mustard seeds. Mustard seeds will start popping up. At this stage add onion, curry leaves, pandan leaf and stir fry. When it starts emitting aroma, add green chilies. Then add tomato slices. Stir fry it till tomatoes are soft. Now add turmeric powder and mix. Then add chili powder, spice powder, fenugreek seeds, cinnamon piece and Maldive fish. If you want completely vegetarian dish, then avoid Maldive fish. Once all mixed, add thin coconut milk and cook for few another minutes till all ingredients are cooked well. Then add thick coconut milk and simmer in low flame. Stir time to time to avoid lumps. Simmer till you see oil appear on top of curry. Adjust salt as per taste. Add lime juice and remove from the stove. 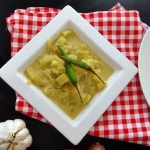 Tip: Add banana peppers or capsicum to the curry. 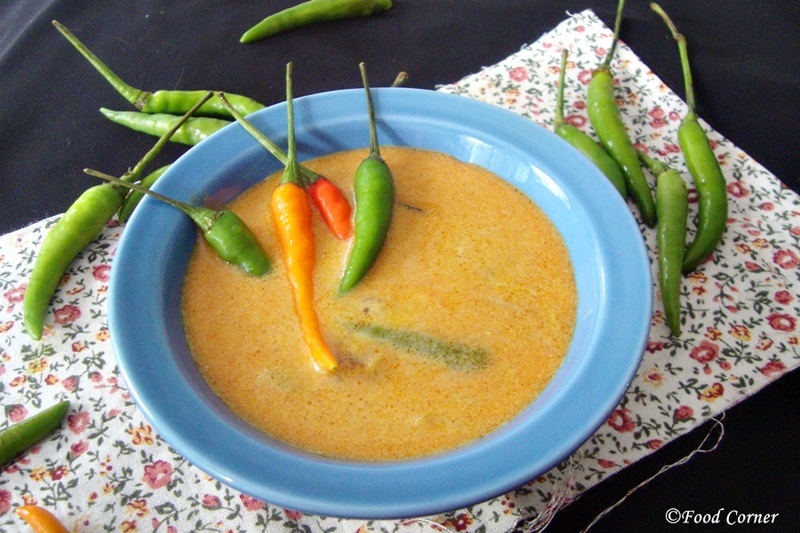 Then you will have Capsicum tomato curry which gives great flavours. Nicey. Something like sodhi but a different version. Done with deciding what to cook tomorrow. This is how we cook Thakkali curry in Sri Lanka.Hope you’ll try.